We love your blog Katie, and you are a princess! Remember you rule the housekeepers, so keep them on their toes at all times. 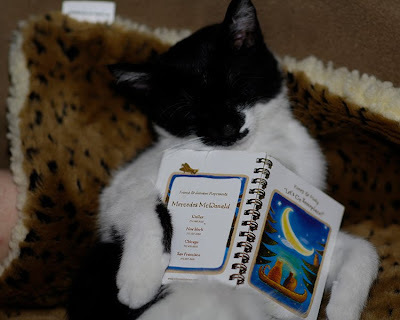 Looks like a good book to put you to sleep. I think I need that book. What a cute little book. I like to sleep on top of my mom's thick books. That way, she pays attention to me and not the books. Oh wow! I gotta learn to read. 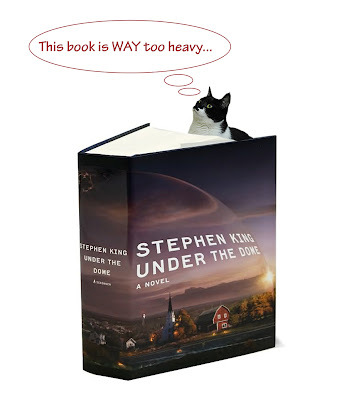 That looks like an awesome book...cat sized too. That looks like a fabulous book; maybe we ought to take up reading too. You'll have to tell your human to make time to play your favourite game, Katie. Sometimes the humans think there always will be tomorrow to play, but our human learned the hard way that that is not the case. So she makes time, even when she knows she has other things to do, to play with us and cuddle us, at least for a little bit every day. We got lots of books here too, yep, I've been known to nap on one or two! Have a wonderfully restful weekend y'all! My mom reads a lot and tries to push the books on us. That'd be alright if we could read. Love your sleeping photo. That little book is just perfect for you Katie. Our mum would prefer Stephen King though. She falls asleep too when she is reading. Agreed, Katie. You ARE a princess and don't let anyone tell you otherwise! Your book looks like quite the read! I'll have to look it up! Ahh...the humans don't understand the day in the life of a kitty princess....! And Stephen King must not want to reach ALL his potential readers! So, uh--what happened, since the ellyphant showed up...? And I love your photos. Haha! 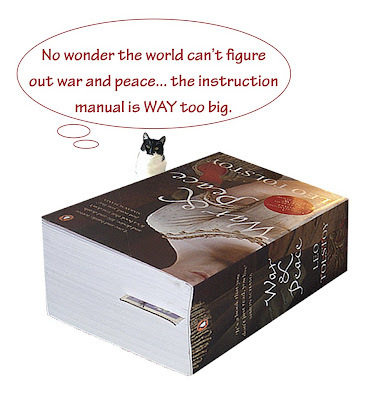 Katie, that book is the purrfect size for you! We don't read much around here...we mostly sit on the books and magazines when our mom tries to read!! "War And Peace? What is IT good for? When my Mommy read that, she had to go and get a kleenix, cause she spit a liitle diet coke on the screen. Oh no you're the queen and you rule with an iron paw. See I understand because I'm the queen in my house and it takes an iron paw to get things done the right way around here. Good books are hard to find! I just carried my Yellow Kitty from our upstairs bathroom. She stays there because of Barney the dog and it has a second story window and is very warm in there. She sleeps in her basket at night but all day she basks in the sun and gets so very warm. I guess I need to go through our books and see if there is something she could read. Yellow Kitty is way over 14 years old so I may need to buy her some reading glasses. Take care Katie and I see you can read yourself to sleep too. We LOVE the pictures. You look so cute all curled up and comfy with your book. Mama really likes the pictures of you with the Stephen King and War and Peace books. You book looks interesting for a book. Congratulations on your 101st post! The cat and squirrel "relationship" portrayed in your book sounds rather controversial. We are very curious about how it all turns out. You reminded Mommy of an item she saw that could be ordered online called "Teach Your Cat to Read with Kitty Literacy". It was a set of little books and a combined feeding dish and bookrest. Mommy thought it was really funny. Hihi, you look just like photoguy when he has been reading his books. Our Mom looks like that effury night! We like your new blog header! Katie, you are so cute with your book. We can't understand why Glogirly would rather play with resumes than with you though. Your blog changes look great Katie! 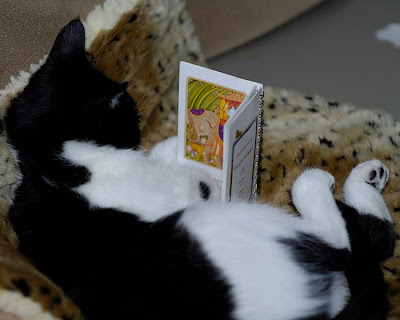 That is a perfect cat-sized book. Maybe I need to rethink my book size? Katie, Has anyone taught you to read between the lines? I can walk, run AND read between the lines. We love the last picture. You are adorable all in dreamland like that. You are not just a pretty face, you are one smart kitty! Reading books! I'll leave that to SS; I just sit on them. That book is just right for you Katie! Is dat book for insomniacats? Oh yea, love the new blog look and I am following you on twitter now (@brian106sc). Hey, don't forget to give us a book review when you wake up, Katie. Katie, you are so cute! There's nothing like curling up with a good book. That looks like a good book! Let us know what happens after your nap! Katie, Cleo asked me remind you that you have more than a book - check out the coil on the spine! Rub against it, bite it, and if it begins to come un threaded from the pages, it's an even better toy! That picture books looks so much more interesting than that heavy stuff! We loves books here! Psst, Katie... come here and I'll read to you, and whisper sweet nothings in your ear!! Ahhh miss Katie, you are like my mum. 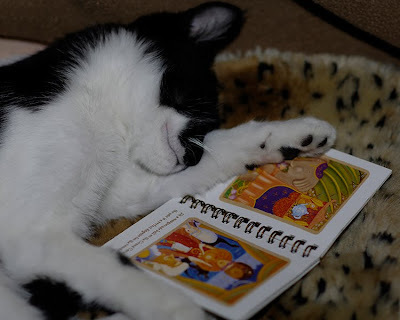 a little bit of reading sends her to sleep too. ohmigod Katie,I'm late!Please forgive me! Adorable pictures dear Katie, you are so clever and intelligent!It amazes me! I just wanted to alert you that your LOLSpot feature is posted. I usually ask that the featured blogger at least post a link to my site at the end of their post -- just for the day. I have already posted a link to your site from mine. Please come by and take a look and let me know what you think! Oh you look so cute with your book Katie!